Today I thought I’d write about a slightly different walk – a route between Chapman’s Pool and Kimmeridge on the Jurassic Coast of Dorset. Now the normal route takes you along the cliff tops with great views out to sea……..and some steep climbs! The alternative route that I walk occasionally is along the water’s edge at the foot of the cliffs. There are no climbs, but there are other issues to watch out for! The first difficulty is in trying to access the beach at Chapman’s Pool as the way down can be very muddy! In fact the last time I was there, I came across a wellington boot buried up to the hilt in the mud and that had clearly been vacated by the foot of some unprepared holiday maker who presumably walked bare foot from that point! The thing is, it’s not just mud, it’s sticky mud so you need to pick your way down carefully, especially after rain! Once you reach the sandy/gritty beach, you find yourself in a great place away from the crowds and with the gentle lapping of the water to provide the musical accompaniment. With Emmets Hill on one side and Houns Tout on the other, it is usually a sheltered spot. It’s an interesting place too, with a range of fishermen’s huts at the south eastern end of the beach, and also the remains of a row of coastguards cottages just above – the latter were vacated I believe because of difficulties getting the children to school so they moved to the top of St Aldhelm’s Head. The view west from Chapman’s Pool with Houns Tout across the bay. The route from here is westwards and having gone around the beach, you have to resort to rock hopping around Egmont Point to reach one of the Purbeck’s few water falls at Egmont Bight. This is in fact the water shed from the Encombe Valley which in some ways is strange because the valley has no river! What it does have is Encombe House, one of four Purbeck stately homes, which has a series of man made lakes below it. I bumped into an old quarryman once at Chapman’s Pool and he told me that in fact the water supply to the Encombe Valley had been taken from the next valley by diverting a stream along pipes bored through the headland. I’ve haven’t yet been able to corroborate this story. The waterfall itself has moved slightly in recent years due to erosion. Egmont Bight does highlight one of the issues on this walk though and that is the tide! When the tide is high, the way through is cut off and that is more of an issue if you are farther along the walk because this happens in several places which means you could be cut off with no way off the shore other than to swim – probably not a good idea in winter!! The moral of the tale is to only walk it at low tide! 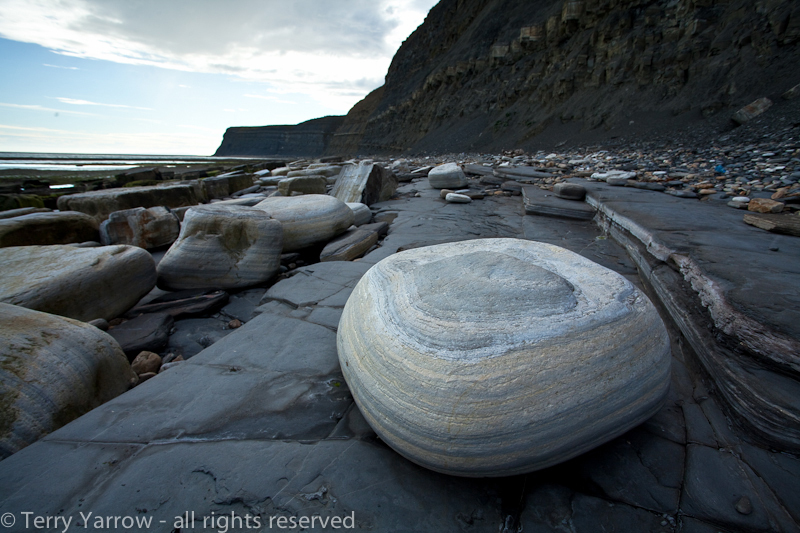 In any event, it is a better walk then because this part of the Dorset coast has many slate ledges which stretch far out to sea and these are revealed at low tide. It is a strange feeling walking right out to sea on what is usually the sea bed and to then turn round and get a totally different perspective on the coastline. Rock pools always add interest. In addition to the ledges, there are lots of rock pools which always add interest to a walk, and some amazing rock strata in the cliffs, not to mention fossils. Personally I think the rocks are beautiful along this part of the coast with the softer stone being worn smooth and round by the action of the waves – with their lovely grain running through, they contrast starkly with the flat dark grey of the slate ledge. Beautiful rocks litter this part of the coast. 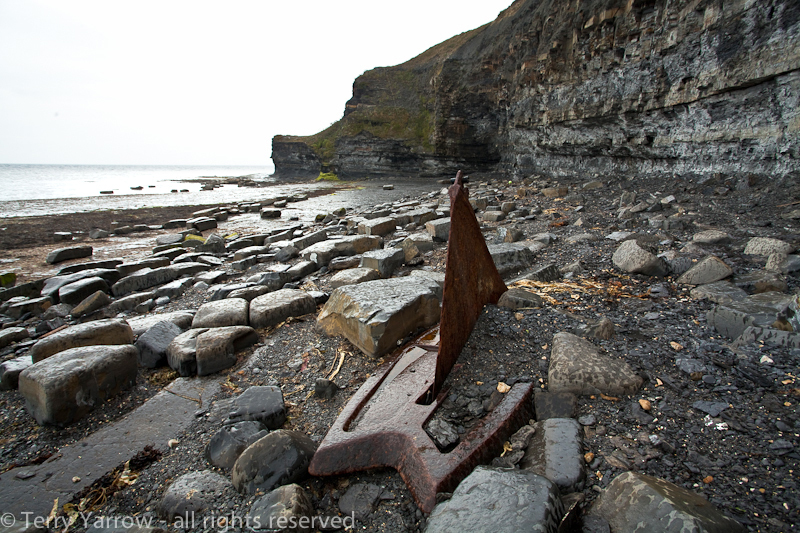 There is usually a lot of debris washed up on the rocks, especially after a storm – you never know what you will find! 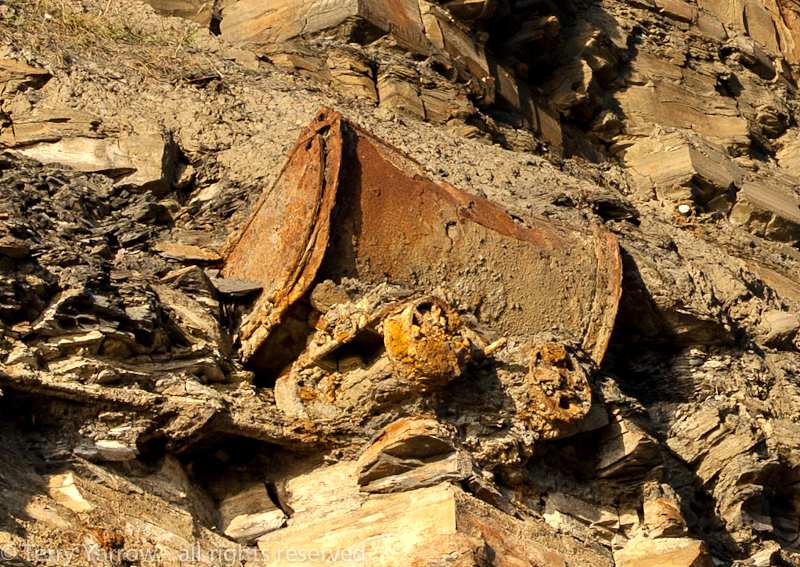 There are also the remains of many mines and quarries, although these are gradually disappearing (and in some cases reappearing – see below) due to erosion. In the picture below, the ledge in the distance is part of an old quarry and years ago there was an open mine entrance above it that you could go down into for a short distance – this has since caved in though. 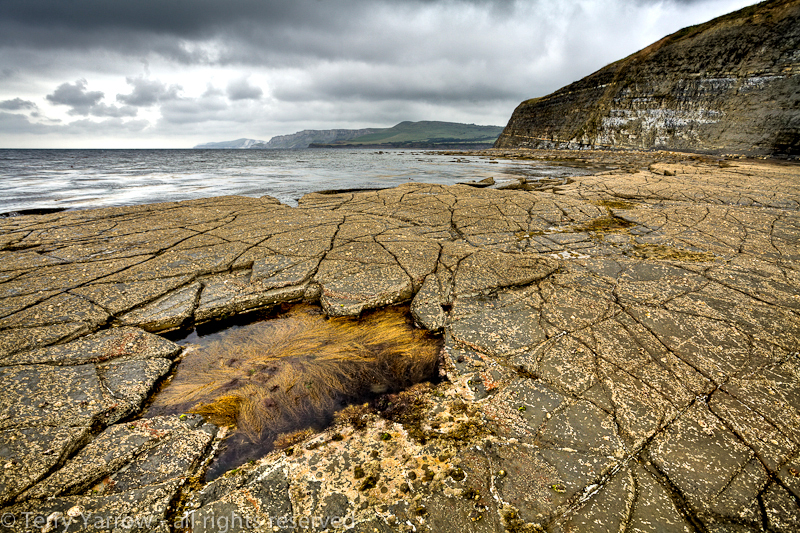 The cliffs along this part of the coast have often caught fire – a strange phenomenon until you realise that the cliffs are made of Kimmeridge Oil Shale, which is a naturally flammable material. Coastal debris with the quarry ledge beyond. 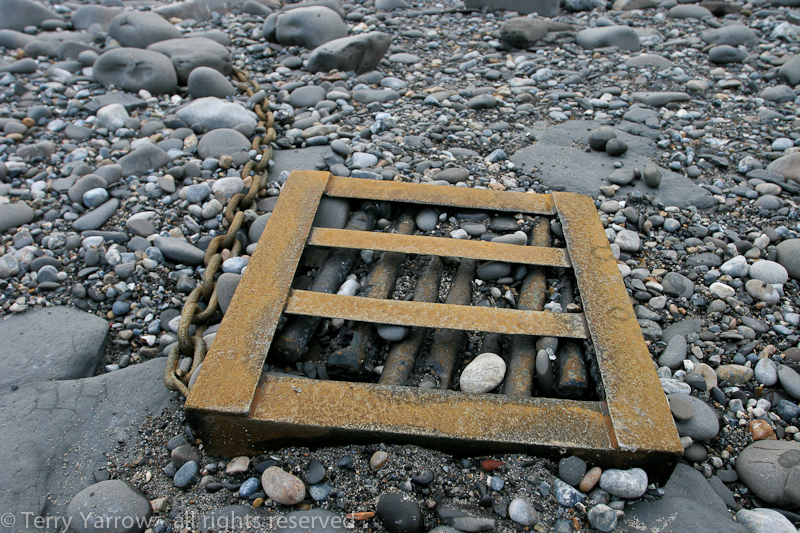 More coastal debris – but what is it? I mentioned above that erosion can sometimes reveal hidden secrets – the picture below illustrates this well. This old quarry cart, still sat on one of the rails it was left on when the mine closed, has recently come to light. It is part way up the cliff face and sits in what was once a mine shaft which must have collapsed many years ago. Erosion has brought it out into the light again and more erosion will probably bring it down to the rocks below at some point. I understand that some thought was being given to bringing it down as a museum artefact. An old quarry cart comes into the light of day again. 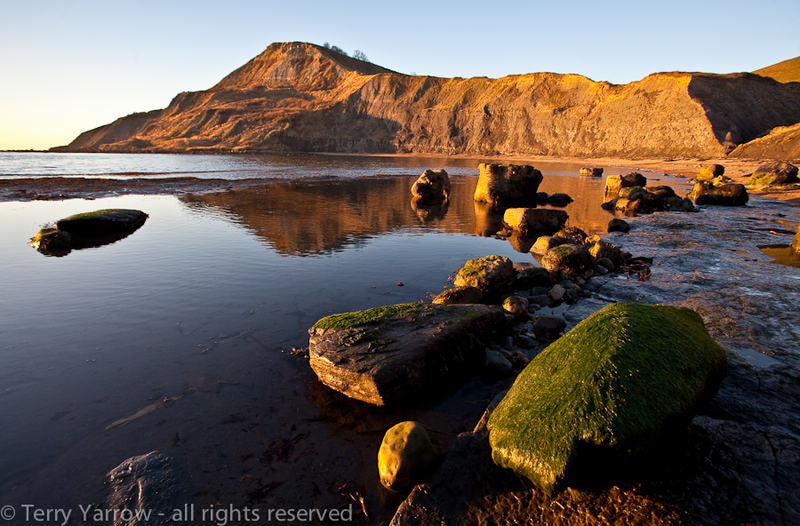 As you near Kimmeridge, you will often come across photographers because this is a very popular and photogenic spot with its rugged foreground and famous ledges, not to mention Clavell Tower on the headland above. And at sunset in winter, it is particularly lovely with a beauty all its own. 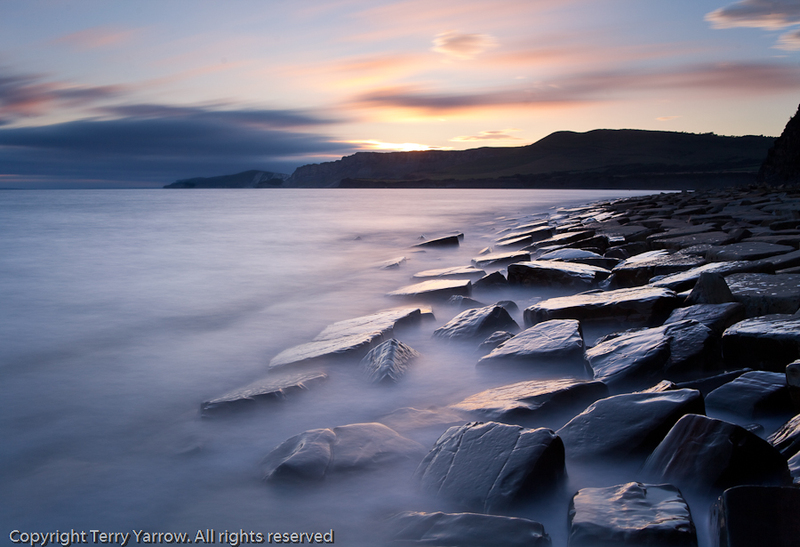 But Kimmeridge is a story for another day! In reality, the route is not far from the normal cliff top route but the view is very different. It is rugged and rough with lots of hazards like the tide and slippery rocks, but lots of interest too. Don’t expect to walk it quickly! 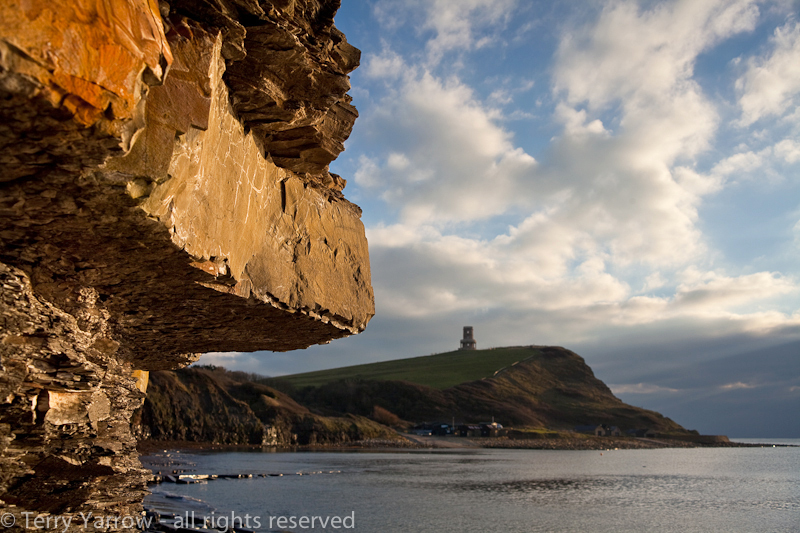 Kimmeridge with its amazing rock strata and Clavell Tower in the background. Previous Another lovely spring day in the heart of Dorset! Next Walking the Dorset Mills! Thanks Steven :)! I try to vary the photography on here to illustrate Dorset but I enjoy taking seascapes.